Buy the Student textbook receive the digital eBook included for free*! The New American Bible Revised Edition (NABRE) translation is used in Grades 4-8. All Scripture passages are in Scripture blue. An oil lamp symbol designates Scripture passages and quotes. 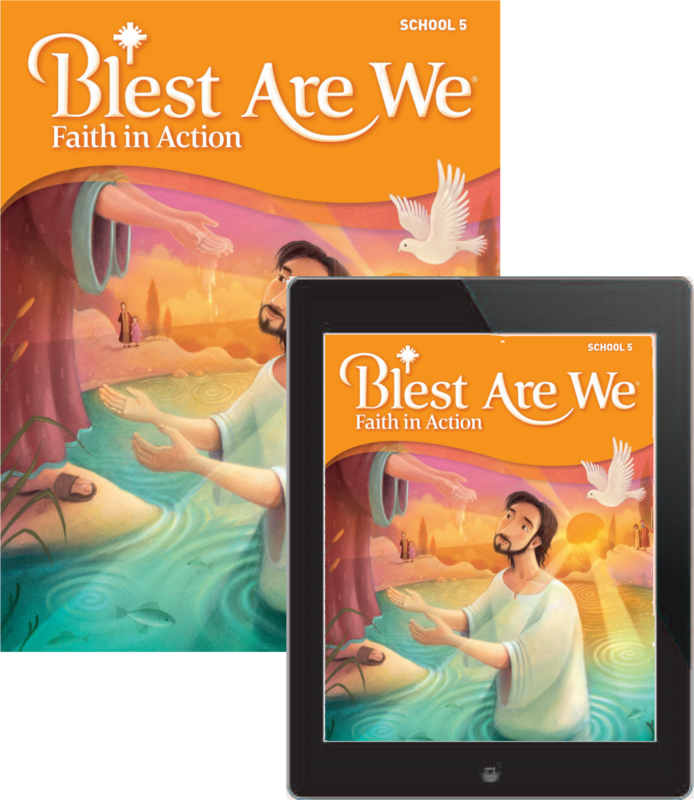 Engaging Scripture illustrations by a single artist in each grade level provide continuity for studying Scripture. Redesigned first page is colorfully engaging and user-friendly. Images for Saint of the Week have been added in a wide variety of illustration styles. BlestAreWe.com, SaintsResource.com, and RCLBLectionary.com references have been added throughout the book. New design is colorful, engaging, and emphasizes the Faith in Action feature in this series. More emphasis is given, especially in the Teacher Guide, for a greater connection with specific principles of Catholic Social Teaching. Ordinary Time section (and lesson or lessons) is now at the beginning of the Feasts and Seasons section. New design is more appealing and colorful for the digital learner. Lessons are now front and back rather than in a spread format, allowing for easier access to take home. Catholic Schools Week prayer, tying in with grade-specific lessons, has been moved to the website, allowing for a more substantive and liturgically-based ritual prayer. Student textbooks now packaged with our latest digital resource included free! Stories and lessons come alive in an online format! *Purchase one student textbook and receive your first year subscription to the eBook absolutely FREE!